Sponsors: Wavefront Surf Shop - Ventura CA, Bettybelts, Ola Surf Grill, Top Dog Barkery, Salt Water Raised, Replayxd, Hot Dog Collars, Glogglz, Ezydog and Clyde Betty Jr. Surfboards. Spokesdoggie for: Bark-Box and Catalyst Phone Cases. We were fortunate enough to find Haole spending his time at 12 weeks old in a pet supply store. The owner wasn’t sure she wanted to part with him, but she did! He is on the whiter side of yellow labs, very mellow and chill, so we figured he was the perfect Haole! (which is Hawaiian for a “white-person”, a non-native Hawaiian), and he for sure is always on Hawaiian time! Haole loves his life on his own time! His calm, loving personality makes you fall in love instantly. Haole started surfing in May of 2013, whe he told us he wanted to get on a board! 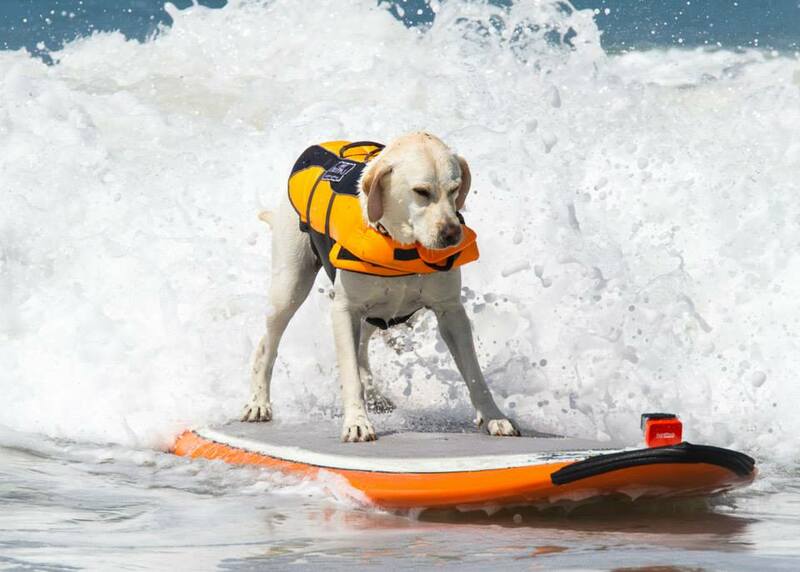 We knew this because he tried to get on dad’s surfboard; so we figured “why not”? He was a true natural! Haole has incredible balance and will shift his body with the movement of the board. 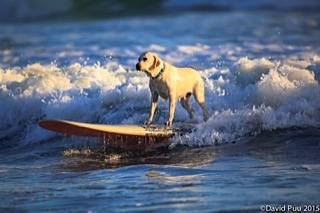 From the time he was a pup, he has been riding on the back of a golf cart, which is his favorite way to take a “walk”, so this we believe gave him confidence on a moving surfboard. 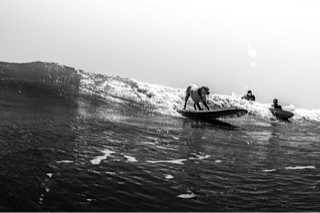 Shortly after he started, we found out about Dog-Surf competitions. 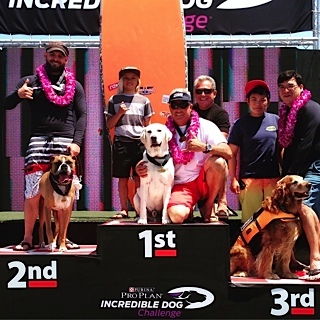 We signed him up in the Surf City Surf Dog contest in September, 2013 with no expectations other than having fun and along with that we had the thrill of placing First for the xl class. Wow! We were so proud! Haole has been the “child” that we didn’t have. He has completely filled that void and is truly a life-changer. He has a wy of bringing a smile to everyone he meets and brings joy to those who know him. It’s strange to say that a dog can bring people together, but we have made so many friends through Haole! There’s nothing better in life that to do the things you love with your dog. We love to surf and we now enjoy it as a family! 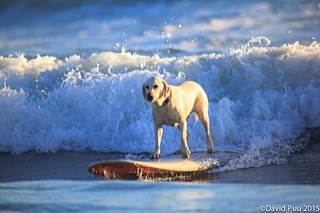 On a side note, Haole is a big brother now to Primo, who has also caught the surfing “bug”; seems to run in the family! 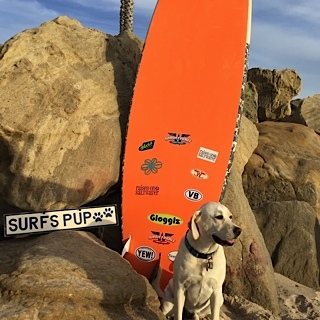 We have been honored by the City of Ventura, who has made Haole the Official Ambassadog of Ventura and they have given him his own blog on visitventuraca.com. 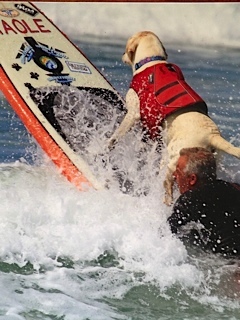 He has been the only surf dog to exhibition at the infamous Surf Rodeo festival in Ventura. 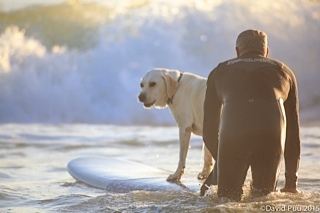 His picture made it in the OC Register and Ventura County Star (surfing tandem with a couple of our surfer friends)! A local magazine, DEEP, asked Haole to be a “model” in this summer’s bathing suit issue.